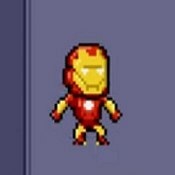 Description: Play as a little Iron Man with a big head. Destroy bad guys and boxes. A weird but fun little bootleg!